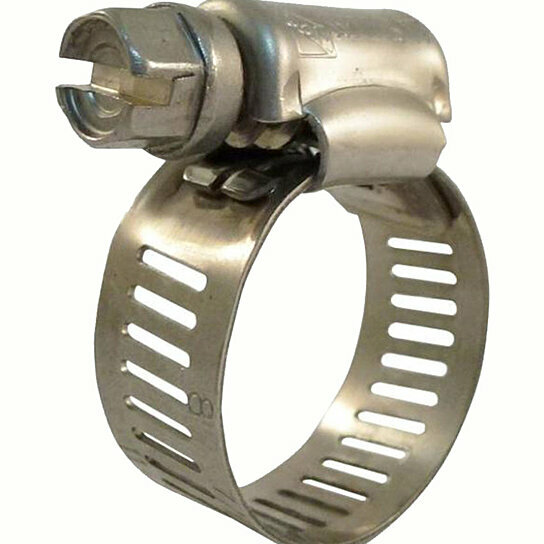 300 AIS high quality 1" Stainless-Steel Clamp. The clamp fits 7/16" to 1" Dia hoses and is constructed from durable stainless-steel. The bands have punched rectangular perforations that help hold strong and connect easily. Maximum hose size compatibility: 1", Minimum hose size compatibility: 0.4375", Repair Clamps Type: For Hoses. Maintenance, Repair & Supplies Product Type: Repair Clamps. Warranty: 1 year. The clamp fits 7/16" to 1" Dia hoses and is constructed from durable stainless-steel. Color: Silver. AISI 300 series stainless steel material. Tub makes for easy storage. Product Dimension: 1.3"D x 0.6"H x 1.3"W, Finish: Stainless Steel. Rectangular perforations help to hold strong and connect easily. Corrosion resistant. Size: 1-1/4", Size range: 1/2" to 1-1/4"